This 21-story structure has only 17 apartments and is one of the city's most stylish white-brick apartment buildings. Designed by Robert L. Bien for the Frouge Corporation, the building was completed in 1963 and converted to a cooperative five years later. Its top is reminiscent of an oceanliner with its very large curved window bays on the two highest floors facing the avenue beneath its large enclosed watertank superstructure that has a rather dramatically perforated rooftop watertank enclosure. The central portion of the side-street facade has decorative angled piers that give the building a strong sense of upward thrust although they are contained between horizontal bands of large picture windows at the building's corners. The central portion of the avenue frontage consists of balconies with thin railings that are largely recessed but that also protrude slightly and the base of the building on the avenue is recessed behind some landscaping and a grill wall. The composition is quite energetic and a blend of the delicacy of Edward Durrell Stone and the strength of Le Corbusier. While the building is not a masterpiece, its setback massing and facade experimentation is vigorous. In sharp contrast with the multitude of white-brick apartment buildings erected in its generation, this building is interesting, although a bit out-of-place for such a choice location across from Central Park. 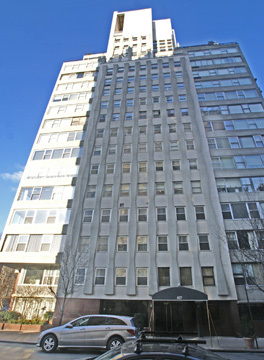 In his excellent book, "New York's Fabulous Luxury Apartments with Original Floor Plans from the Dakota, River House, Olympic Tower and Other Great Buildings," (Dover Publications, Inc., 1987), Andrew Alpern wrote that this building "represents a return to the privacy of one apartment to a floor and to the distinct separation of the private bedroom area from the more public entertaining rooms." "For parties, the plan affords three very spacious main rooms all of which open onto a large entrance gallery. Two bathrooms are available in this area together with ample closet space," Alpern noted. 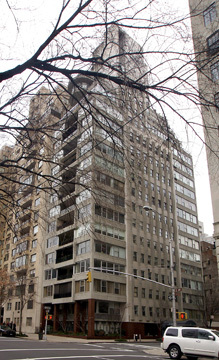 Alpern was not, however, enthusiastic about the building's exterior: "It is unfortunate that the exterior of 857 does not approach the quality of its interior. The facade is a gauche assemblage of disparate materials that contrasts sharply with its more sedate neighbors." Despite such criticism, the building is certainly one of the better post-war buildings on the avenue and its layouts and views are impeccable. It is convenient to cross-town bus service and a local subway station is at 67th Street and Lexington Avenue and many of the world's most famous boutiques are just a block away on Madison Avenue. The building, which has great views and a doorman, was erected on the site of the mansion of George Gould, the son of robber baron Jay Gould. "In 1961 yet another venerable Fifth Avenue townhouse, the fifty-room, six-story limestone mansion at 1 East Sixty-seventh Street, was purchased by a builder and slated for demolition. The house had been designed in 1895 by Horace Trumbauer for George Jay Gould. In 1924, a year after Gould's death, it was purchased by Mrs. Cornelius Vanderbilt II. When Mrs. Vanderbilt died in 1934 at the age of eighty-nine, her daughter, the Countess Lâszló Szechenyi, sold it to the Institute of International Education. The garish seventeen-story apartment at 857 Fifth Avenue (1963) that replaced the Gould house was designed by Robert Bien. It was a glaring contrast to its predecessor, whose 'aura of old, pre-Revolution Paris,' according to New York Times reporter Thomas W. Ennis had helped make it 'one of the most imposing of the many costly homes that made Fifth Avenue a world-famous residential thoroughfare.' 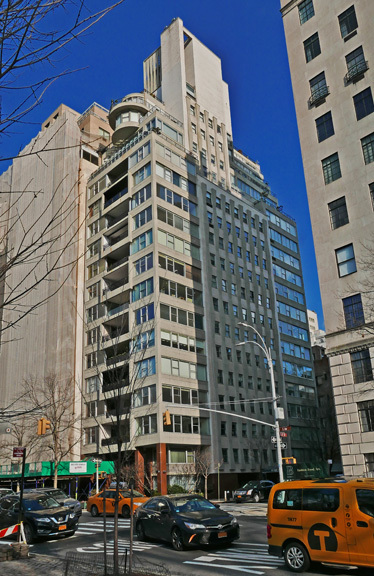 The new building's lower floors flaunted to passersby the aggressive banality of the architect's design: along the Fifth Avenue frontage the building was raised on two-story high, red-marble-clad columns set upon a landscaped podium that seemed better suited to an outer-borough or suburban location than one on Fifth Avenue. The cladding continued along the Sixty-seventh Street facade, which continued the building's principal entrance. 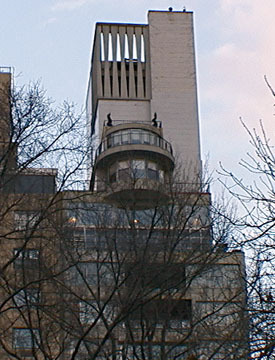 Above the base, a predominantly white-brick exterior included a disarming array of other materials, and decorative elements....Among the building's tackier details were the black metal railings enclosing the awkwardly recessed terraces that face Central Park and the Brutalist-inspired, oddly undulating concrete piers on the Sixty-seventy Street facade. Inside, the apartments were quite luxurious by contemporary standards, with one unit to a floor; a triplex penthouse had two ship-like curving bay windows slightly cantilevered out toward Central Park. The generosity of the apartment layouts made the building's facade seem all the more regrettable." Brutalism, best represented in the city by the Whitney Museum of American Art on Madison Avenue and the MetLife (former PanAm) Building straddling Park Avenue, has had few defenders in the city despite its vigorous and bold sculptural approach to design. Bien's design here is far better than many of its contemporaries although it is not a masterpiece. The "oddly undulating concrete piers" were, in fact, a most welcome departure from the city's rectinilearity as were the cantilevered curved bay windows. Bien here experimented much more wildly than most of his more famous peers. The critics, of course, are correct in lamenting the loss of a major mansion.